Lurgan, Sunday 30th October 2016 -Tranquility, peacefulness, bliss.Dublin, Sunday 30th October 2016 – Mayhem, pandemonium, chaos. Yes this is what happens when you send the St.Peter’s A.C. hallions, sorry I mean runners, from Lurgan down to Dublin for the Dublin marathon! Dublin marathon 2016 marked the 37th running of the event and was the biggest ever running gathering in Ireland with over 19,500 entrants, just pipping the Aghagallon Santa Run of 2015. The numbers were greatly swelled by this being the first ever Sunday race and also with the much sought after special commemorative medal. 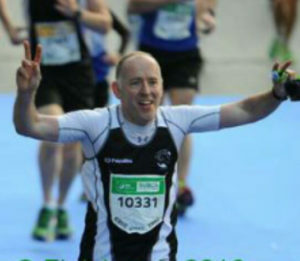 I must stress though that no mention was made of Eunan Magee’s attendance in increased numbers, and without stipulating any direct correlation, it must be pointed out that there were 30,000 entrants signed up the day before Eunan signed on the dotted line, and only 19,000 on the start line on race day!! 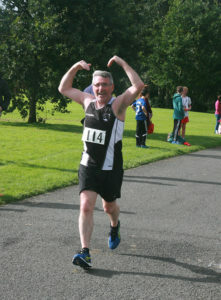 At the heart of this event was our own club St Peter’s AC Lurgan, although with a heart like that you could argue that there was a distinct possibility of a cardiac arrest for the occasion. In the region of 24 St Peter’s runners (again can I point out that I have disputed the use of the word ‘runners’ with the editor) including the likes of Paul ‘The Machine’ Mulholland; Colin ‘Cruising Along’ Conway; Grainne ‘Clear The Way’ Crilly; Owen ‘Edible Undies’ Eagers (well so says Dwyer); Barry ‘Shifts-A-Bit’ Shanks; David ‘Mean Machine’ McIvor; Maggie ‘Fast As Ffffffff….ast Can Be’ Fearon; James ‘Road-Runner’ Monaghan; Gillian ‘Mighty Mouse’ McCrory; Martin ‘The White Mo Farrah’ McCracken; Sean and Linda ‘Love’s True Dream’ Farquhar; Paul ‘The Minute Mile’ Moore; Patricia ‘Twinkle-Toes’ Tompson; Rioghan ‘Mucky Minded’ Mc Clean, Conor ‘Shifts Like He Sh*t Himself’ Skelton; Martin ‘I Love Old Chinese Women’ McConaghy; Stephen ‘Love You Long Time’ Lemon; Trevor ‘Marbella-Tan’ Murphy; Stephen ‘Deadly-On-Two-Legs’ Dunn; Mark ‘Left The Rest Of The Field Behind Him’ Leighio; Martin ‘Two Skips & A Hop’ Timlin; John ‘Never Say Never’ Nix; Dwyer ‘One For The Road’ O’Connor, Rachel’ The Rocket Mc Kendry and of course the guru of running himself, Eunan ‘Mr Ahmed’s Kebabs’ Magee!! 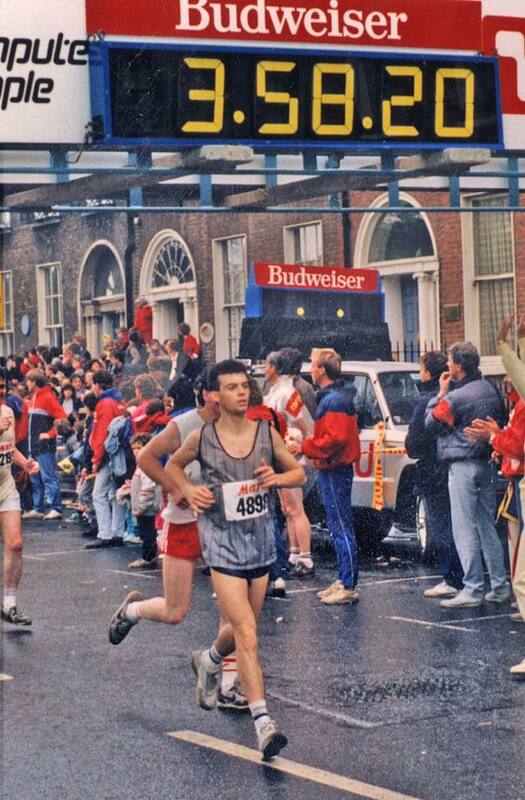 Our club has a long and prestigious history with the Dublin marathon; with some runners celebrating anniversaries, such as Dwyer who having taken part in the marathon back in 1986 when he was just a young lad, aged 45, was now marking 30 years since that occasion in the 2016 event! 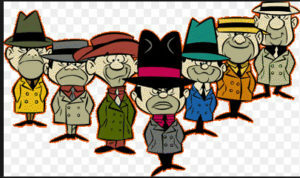 Others including the Lurgan Beckhams, Sean & Linda Farquhar; The Lurgan Linford, Stevie Lemon, and The Lurgan Lay-About, Martin McCracken were making their eagerly anticipated debuts, and the media were in frenzy mode anticipating the arrival of County Armagh’s finest. The Gardai were also in a bit of a frenzy at the same prospect, with all leave cancelled and re-inforcements from the NYPD and London Metropolitan police, flew in to assist monitor the Orchard County contingent. This increase in police presence lead to an increase in checks and indeed Conor Skelton was strip searched on 36 different occasions over the 2 days in Dublin – granted he voluntarily handed himself in and requested the searches personally, but 36 searches nonetheless shows that it was not just Al Qaeeda that kept the security forces on overdrive!! The race itself is a well supported event and draws runners and supporters from everywhere, with flags from Poland, Pakistan, Portugal, East Timor, Romania, Hungary, and China clearly on show…..and that was just the locals in Ballymun displaying their colours!!!! 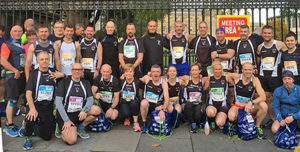 Taking in the sights and sounds of Dublin City and the greater Dublin County, it’s a massive pull for runners to pit their wits (or halfwits in regards the Lurgan crew) against the 26.2miles around the Irish capital. 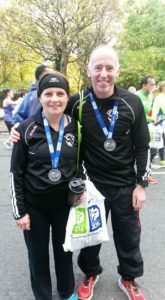 All fared extremely well and credit where it’s due, some runners celebrated personal bests, (rude to mention names, but full applause to the likes of Grainne Crilly, Maggie Fearon, Stephen Dunn, Martin McCracken and Stephen Lemon (hold on, you cant claim a PB for your first marathon can you????) and the oldest runner of the club to do Dublin Paul Casey, aged 54 (ain’t Conor Skelton 65 and Dwyer 75??) who knocked 32 minutes off his Derry marathon time of 4:38, and also finally Gillian McCrory who finished in a very honourable 3.33)! Others celebrating first marathons, included Sean Farquhar in a superb 3.26, his missus Linda in 4.10 and what about the run by James Monaghan……2.49 (Yes that is correct, Eunan was finishing his 10k time when James was crossing the finishing line!) although it must be noted James did spend 45 minutes in the medics tent after finishing (rumours that the medics were all young good looking females are totally unfounded it must be noted)!! I have been asked to clarify in case people are wondering what happened to Dwyer O’Connor – well being a Sunday, he couldn’t miss Sunday Service and so spent a significant time during his run in St Colmcille’s Church, and to make matters worse he wasn’t to know there was a funeral going on at the same time!!!!!! He’d have made it home before darkness fell I am assured only for this mishap, and he would like to thank the race organisers for returning with floodlights, and extra batteries for the race clock to see him cross the finish line. 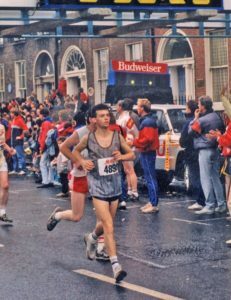 It was a pity the roads could only be kept open for 6 hours, and so Dwyer spent the last 4 hours of his run like a game of frogger, weaving his way in and out of traffic! He had tried getting a taxi to the finish line but stupidly called Trev’s Taxi, which was parked up waiting on it’s own driver finishing the race himself!!!!! 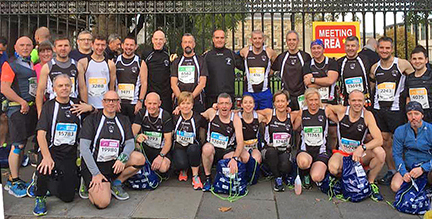 Performance of the weekend has to go to Linda Farquhar for a truly amazing performance in light of a recent personal health setback……well done Linda from one and all at St Peters AC! (Barry Shanks has also asked that I point out that Eunan’s performace in the hotel on the Sunday night was also worth a mention, but you know me, I don’t like to victimise people – suffice to say though that what happens in Dublin stays in Dublin……and the internet! Keeps an eye out for the latest celebrities to fall foul of a s*xtape – when Eunan Magee and Barry Shanks hope to make the Oscars, or at least the Irish gymnastics team, following their night together in Jury’s Croke Park! !